Between late January and early April I worked on the Dusseldorf Aran, as a brightly coloured respite from the winter and a “someone else’s pattern” respite from my own design work. I enjoyed it. I would have liked to have finished it a bit sooner, and gotten some winter wear out of it this past season, but I’m pleased enough that it will be waiting for me in my closet come October. 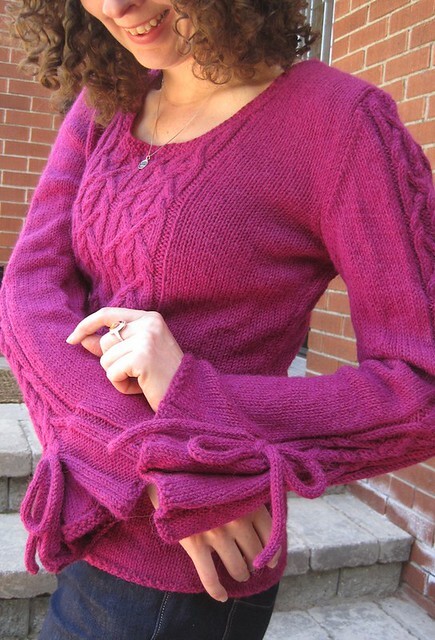 It’s a lovely pattern (Fiona Ellis, for Interweave Knits Winter 2009), and the pleated sleeves are completely fun. Granted, they are also a bit less practical, and this won’t be a sweater to wear while, say, washing dishes in the sink, but it’ll be a nice warm and dressy sweater all the same. The yarn is Ultra Alpaca from Berocco, in a stubbornly bright magenta shade that I found at Stitch in Jordan Station, Niagara, last year. I brought the pattern and materials with me to the Vogue Knitting Live event just to use as a reference for a sweater class with Anne Hanson, and then back in my hotel room later on I thought, “you know, I actually want that sweater. I will cast on right now!” So I did. I made a few modifications – lengthening the torso by about an inch and a half or so, lowering the neckline slightly, and adjusting to a smaller size than normal to account for my slightly looser gauge than what the pattern called for. It worked out well. I hear a lot from knitters who consider sweaters to be in the “wow that’s hard, one day I’ll do that” category. And I get it – a sweater is a commitment. This is more time and yarn than many other kinds of projects. But it’s all incremental. Casting on – check your gauge, check your measurements and size. Choose where you’re going to modify the pattern, if you have to. (Hint: your body may not be the same body as the one in the pattern schematic.) Then move on to the hem, then the decreases, and before you know it you’ve finished the body and are moving onto the sleeves. Anyway, I like sweaters. Socks and other accessories have colonized so much of my knitting in the last year or two that sweaters often get left aside, and I would like to knit more of them. Really, they are the best example of knitted satisfaction – in a sea of commercially-made sweaters that don’t fit you exactly right and aren’t made in the materials you prefer or the colours you might choose for yourself, the knitted sweater is the best example I can think of, of knitters wielding their power to make their closet more satisfying. Heck, I bet Tim Gunn just wishes he had a shelf full of handknit sweaters. It sometimes takes a sweater or two to get there – like anything else in knitting, the first results are often less than perfect. But it doesn’t mean you can’t get there with a little effort. So if you’ll excuse me, I think I’m going to go have a visit with my stash and ponder more sweaters. Who cares that summer is around the corner? Happy Monday! Glenna, that sweater is stunning! Excellant job. Makes we want to make one for myself. Thank you for the wonderful eye candy! I’m drooling. The sweater is gorgeous. The fit is perfect. It will be so fun to wear. That is beautiful! Looks great on you, too. WOW! the colour and pattern are very fetching on you. Kudos to your knitting skills. Beautiful! I’m in awe – pleating , cables, modifications – wow! That pullover is absolutely fantastic! It looks wonderful on you. I’ve been itching to see what it looks like, and it was totally worth the wait. Have fun wearing that in the fall! Glenna, that sweater looks FANTASTIC! I love the sleeve detail, too. No, it’s not a practical feature, but so what? It’s just lovely. That’s a great sweater; the fit is really flattering! Perfect mods. I think the reason I procrastinate on finishing sweaters is because it’s the moment of truth: will it fit? and more importantly, will it flatter? The tension! You look amazing in that sweater! (The sweater looks great too!) 😉 Love it….hmmm, I think I have that color…wonder how much I have…. Love that sweater!! I remember when the Yarn Harlot fell in love with that pattern and just as cool of a coincindence, you used the same exact yarn as I did when I made my very first sweater (last year), although it wasn’t that pattern! Small world, but unique just the same. And thanks for the encouraging post about knitting sweaters; it’s spot on right! You look simply amazing Glenna – you and the sweater are stunning – of course it’s a beautiful garment, but in it you look stunning!!! It’s really beautiful! I love it on you. Beautiful sweater! And you’re right about the finishing. I started my first sweater ever 2/5/11 (also made of Ultra Alpaca, in a springy green color) and finished the knitting of it two weeks ago. Still, it waits for me to get the courage to start the seams. It looks so wonderful now, I’m afraid I’m going to mess it up with my ineptitude. Hopefully, the courage and the right tutorial will come along soon! Your sweater is absolutely beautiful. One reason I stay away from sweater knitting is that I do not know how to make adjustments to the sweater in order to improve fit. Would you be able to do a tutorial discussing some fit changes that you make so we could follow the thought process? Do you have books that you would recommend on the subject? Thank you for your website, it has inspired me greatly. I’m going back to sweaters too. When I learned to knit 15 years ago in England, basically sweaters were what everyone did. You look at the old Rowan yarn magazines from mid 1990s and it’s all big baggy multicolored pullovers from Kaffe fassett and Louisa Harding etc. Lots of intarsia too. But yours is wonderful. Such a great fit. Oh my gosh that is beautiful! omgosh your sweater is quite lovely!!!! I hadn’t seen that issue of interweave knits. I could probably modifiy it to fit me. I loooooove those sleeves. Awesome Job on it!!!! Lovely work, and I like the waist shaping. Love it! Love the color, love the pattern, REALLY love the cuff. Love it! Swooooooon! I just happen to have a bag of Ultra Alpaca down in Stashville. 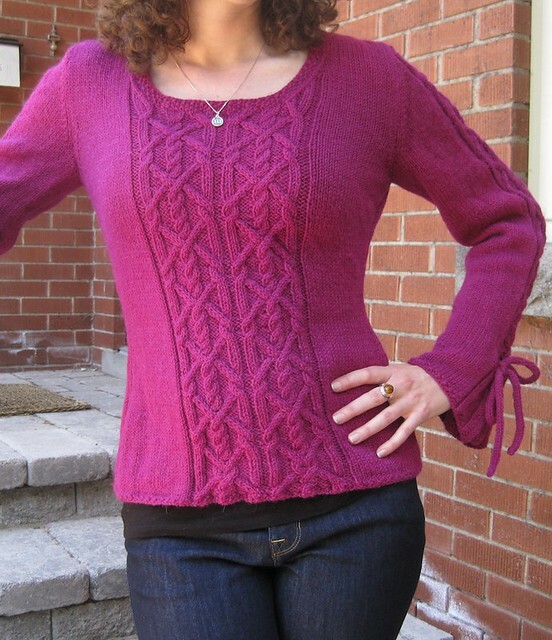 I have loved this sweater ever since I saw it in Interweave knits a few years ago….I wonder if I bought the yarn for this project??? You’ve inspired me to cast on. By the time I’m finished with it & all the UFOs I have hanging around, the snow will be looming again. Incredibly gorgeous! Makes me want to cast on for a long sleeved top — I am often more for sleeveless tops just because they work better in Singapore’s weather! As a beginning knitter, this really gives me inspiration to pick out a pattern for my first sweater project. It is so beautiful, and fits really well. I love it. Like all the other readers have said, that sweater is beautiful! It’s important to get the right mix of pattern style and yarn style – and that’s just what this is, a perfect compilation! Can’t wait to see your new projects as they come.